What is Axure RP ? Powerful prototyping tool without coding. How much does Axure RP cost ? The pricing for Axure RP starts at $29.0 per user per month. 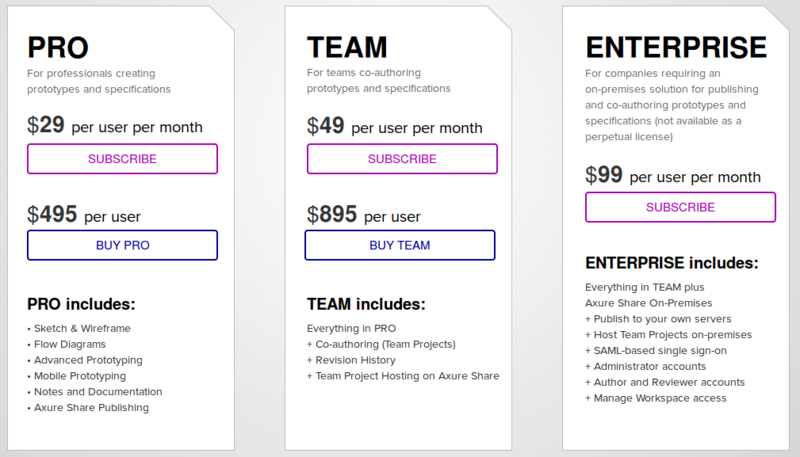 Axure RP has 4 different plans such as - AXURE RP PRO at $29.0 per user per month, Axure RP TEAM at $49.0 per user per month, Axure RP ENTERPRISE at $99.0 per user per month and Upgrade Editions at $400.0. Axure RP offers a Free Plan with limited features. They also offer an Enterprise Plan for their product. Please Contact the Vendor to get the Detailed Pricing information. FREE FOR STUDENTS : If you are enrolled in a degree program at an accredited high school, university, or community college, you are qualified to receive a free one-year subscription license for Axure RP Team. FREE FOR TEACHING AND CLASSROOM/LAB:If you are a teacher or professor and want to use Axure RP Team in your class, we can provide you a free educational perpetual license to teach with and to install in your classroom/computer labs. Site licenses are available for purchases of 20 Plus perpetual licenses. The vendor provides discounts to academic, non-profit, and government organizations for perpetual licenses. Annual subscriptions purchased by PO also qualify. Subscriptions purchased online are not eligible. Disclaimer: The pricing details were last updated on 16/05/2018 from the vendor website and may be different from actual. Please confirm with the vendor website before purchasing. "AXURE RP USEFUL SOFTWARE BUT STARTING TO AGE"
Axure RP was one of the first softwares that made prototyping very fast and easy for designers. I enjoyed using Axure RP when learning about UX Design because it was simple and allow me to easily learn how to prototype and use interactive ui elements by clicking and dragging. And most importantly the use of layers! 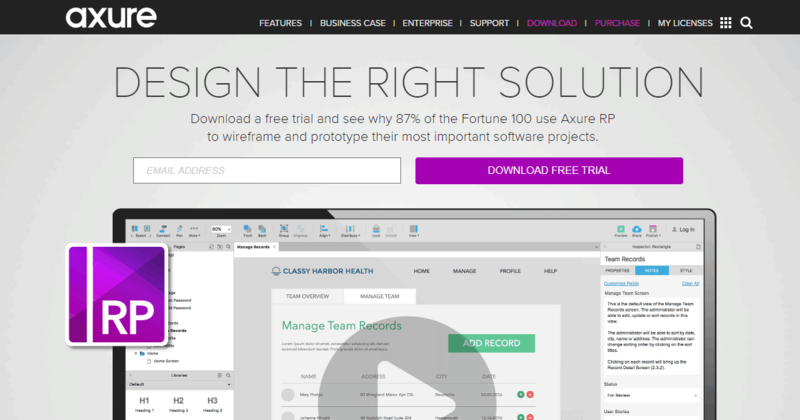 Axure RP needs a ton of work in making collaborating and sharing designs faster and easier. I personally hated working on a prototype with other designers and having to manually uploaded to the cloud every time instead of doing it automatically for me. There were times were both designers would be working on the same page and either one of us would lose our work because there is no way where Axure lets you know someone else is currently working on the project. If you collaborate in teams maybe Zigma is a better option as everything is stored instantly in the cloud. There is no lag between multiple designers and you can see exactly who is working on what artboard at the moment. Providing web applications architecture for developers to program based on my designs. As a UX Designer, I make sure all interactive elements are user friendly and easy to use to create a great UI. "Great product and getting better"
The ability to collaborate with a team (using version control) to iterate on wireframes and prototypes, annotate functionality, and gather feedback. The interaction capabilties and functionality is top notch and really sets this tool apart for those times that you need to create complex and interactive prototypes to convey the experience. It is also very helpful to be able to have shared and managed libraries of components and widgets to standardize patterns across the team and save time. The mobile prototyping experience is still a little clunky and takes some getting used to. The interface is also a little dated and the learning curve can be quite steep for some of the more complex tasks. If a few people on the team don't know how to use the team features, it can really slow everyone down. Spend time to educate stakeholders and partners on how to use the commenting features of AxShare to make the most of the collaboration features and take full advantage of their cloud offering. We've been able to quickly visualize and prototype new experiences as well as increase communication and shorten feedback times with stakeholders. Axure is a great prototyping tool that allows you to implement micro interactions for user testing. It’s very robust tool that allows sophisticated interactions. Sometimes the files can get very heavy and crash. It’s also has a higher learning curve to learn conditions. Due to that the company is trying to push for sketch. But most companies are pushing for it as it’s cheaper. The ability to prototype in-depth compared to sketch. It's a lot more helpful to prototype websites on this application for more complex interactions. Transfering stuff to and from sketch can make things a little broken. Watch some tutorials on Youtube to get a good grasp of how to use some of its functionality, such as maga menus or implementing the parallax effect. Also, don't get too freaked out initially, learning the software becomes pretty easy after a while. I really liked the compatibility with different devices like desktop, laptop, tablet and mobile. Designing the wireframes was easier. 1. Very simple and easy to use. 2. The prototypes can be shared via a unique url. 3. Efficient and fast prototyping tool. 1. The look and feel / User experience of the completed prototype could have been made better. 2. A little low on resolution. 3. More shapes and glyphicons if added to the library would have been better. Design of Prototype of webpages before starting in the development of the screens. "One of the most Serious prototyping tools Available"
This tool has been a blessing for me. I work for a product which requires fairly quick changes and Working as a Business analyst The workflows can get tedious at times. I was using Visio and swimlanes also some free wireframe tool but wasn't able to convince the dev team clearly of the requirement untill I came across the full version of this tool. The ability to edit and design my UI and fix my webpages. Glitchy on the Macbook but very good on windows. Solve UI problems for webpages.